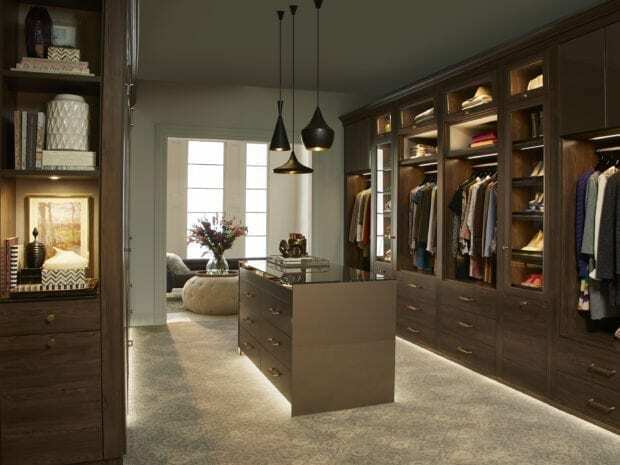 A custom bedroom closet is crucial for maintaining tranquility within the most relaxing space in your home. 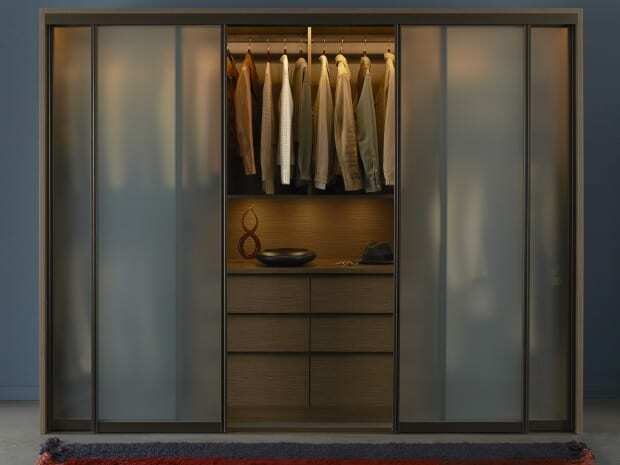 Our innovative custom design options — which include accessories, finishes and lighting — can take your reach-in closet system to a new level of organization or make your walk-in closet system feel like a retreat from the everyday. 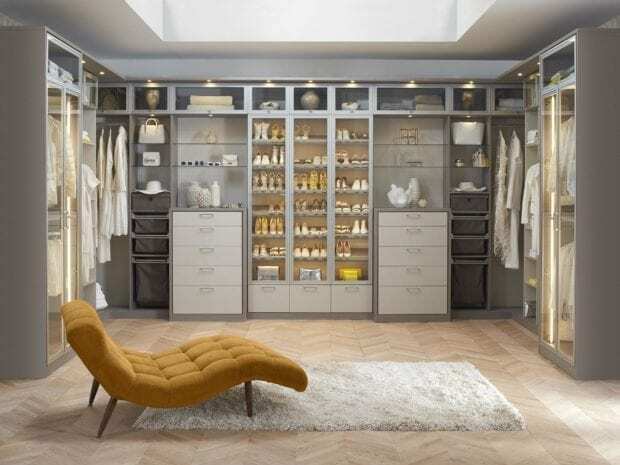 By maximizing the hidden potential of any bedroom closet with a personalized closet design tailored to your needs, style and budget, exceptional storage and organization will be an integrated part of your daily life. 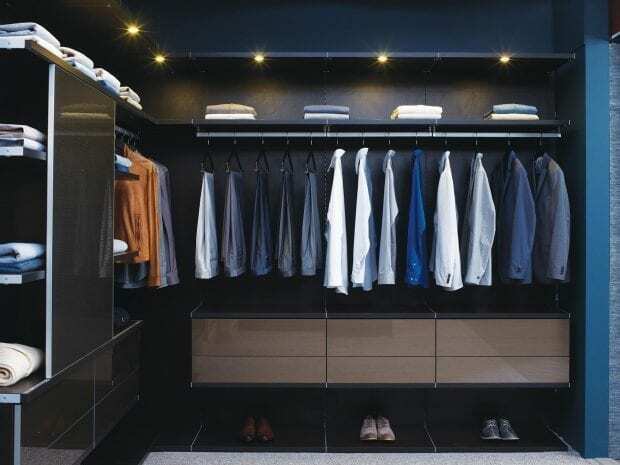 A custom organization solution for your walk-in closet amplifies usable space, taking advantage of every square foot while showcasing personal style. 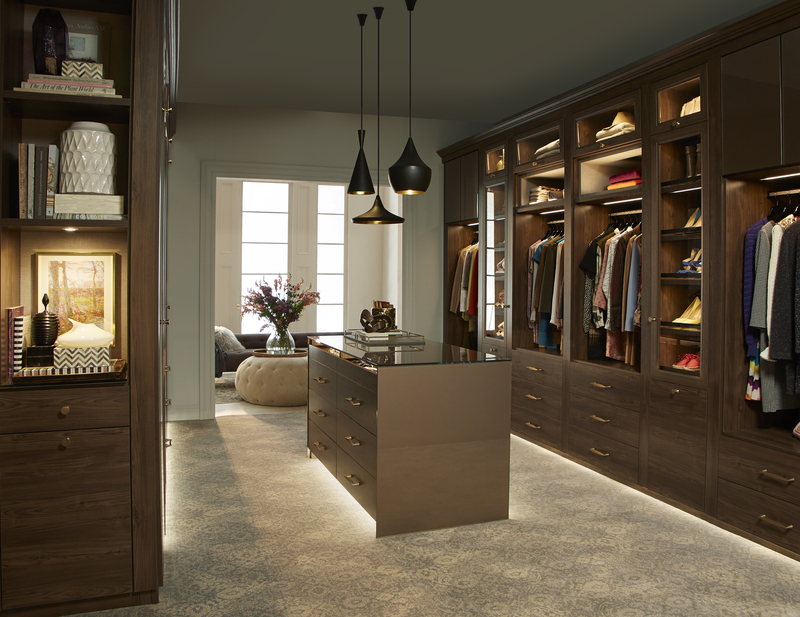 A reach-in custom closet system allows you to increase the use of a small space and make adjustments based on evolving needs. 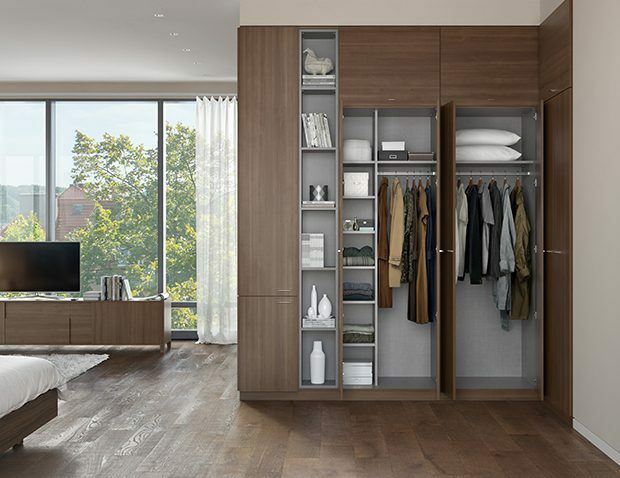 A sophisticated and functional wardrobe provides a closet system wherever you need it, organizing belongings behind closed doors. A kid’s bedroom system includes adaptable closet organizers to grow with your child. Specialized racks and other clever accessories provide further utility and efficiency. 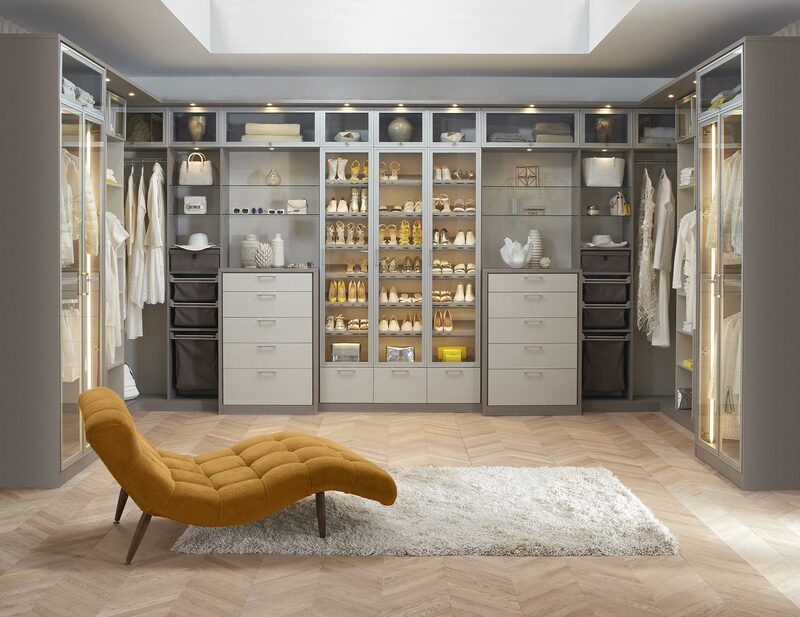 This reach-in closet with built-in storage — and styled with Italian glass door accents — creates a functional and stunning design. Classic White finish lends sleek, modern feel. White slab door and drawer fronts create a seamless look. 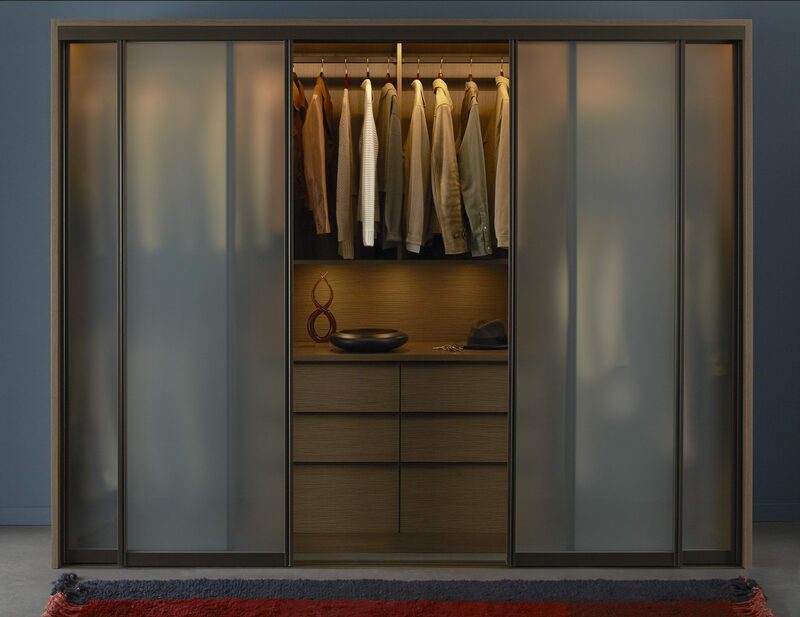 Aluminum sliding custom closet doors with custom back-painted glass inserts add youthful flair. Pull-out desk countertops provide work space when needed. Clean lines and a plethora of behind-closed-doors storage areas create a centerpiece that's both minimalist and timeless. Lago® Roman Walnut finish creates a seamless, minimalistic look. Tesoro™ Linen inset accents offer contrast and a light touch. Roman Walnut slab door and drawer fronts create a sleek aesthetic. Brushed Nickel decorative door hardware adds polish. 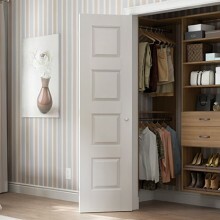 Wardrobe provides deep concealed storage. Insert countertop area offers a place to display collectibles. This sumptuous space, complete with a leather-covered center island, is reminiscent of a high-end men's boutique. Large center island with drawers and cubbies offers additional storage for shoes and accessories. Beautiful and efficient, this sophisticated — and masculine — design ensures that every item is within reach. Aluminum poles and accessories add light accents to the dark color palette. By pairing a reach-in wardrobe with a built-in credenza, this elegant mid-century-inspired master closet provides storage and classic style. Lago® Roman Walnut creates a rich and classic look. Bronze powder-coated Aluminum sliding doors with Frosted glass inserts add texture and conceal clothing. Warm white ribbon light illuminates the space. Push-to-open door hardware offers ease of use. Oil-rubbed Bronze finger pull drawer hardware adds a minimalistic accent. Deep texture slab custom closet door and drawer fronts bring texture and depth to the space. Belt, tie and valet accessories ensure organization. 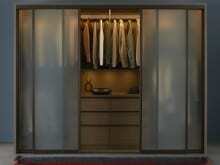 Bronze powder-coated Aluminum sliding custom closet doors with Frosted glass inserts add texture and conceal clothing. 5-piece Traditional custom closet doors and drawers with clear glass inserts display clothing and accessories. Inset bench detail in island offers a place to sit. Glass-front boot storage drawers makes shoes easily viewable. 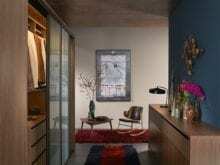 Designed as a custom piece of furniture, this wardrobe adds essential storage to any small space. Lago® Sorrento finish creates a rich, modern look. 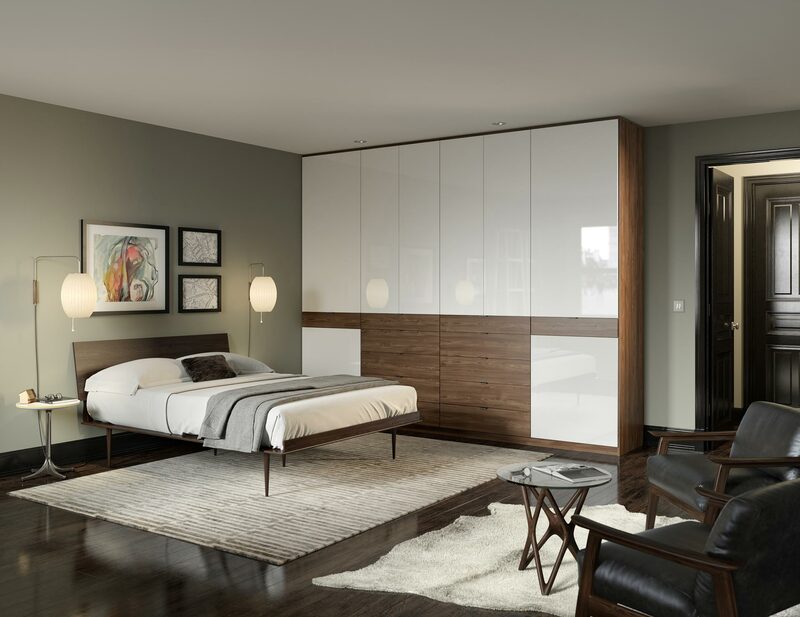 High-gloss White drawer and door fronts provide sleek contrast. Stainless steel finger pulls add polish. Slab Lago® Sorrento custom closet door fronts add visual interest and contrast to the design. Oil-rubbed Bronze metal accents and accessories blend seamlessly into the color palette. Wardrobe style offers concealed storage. 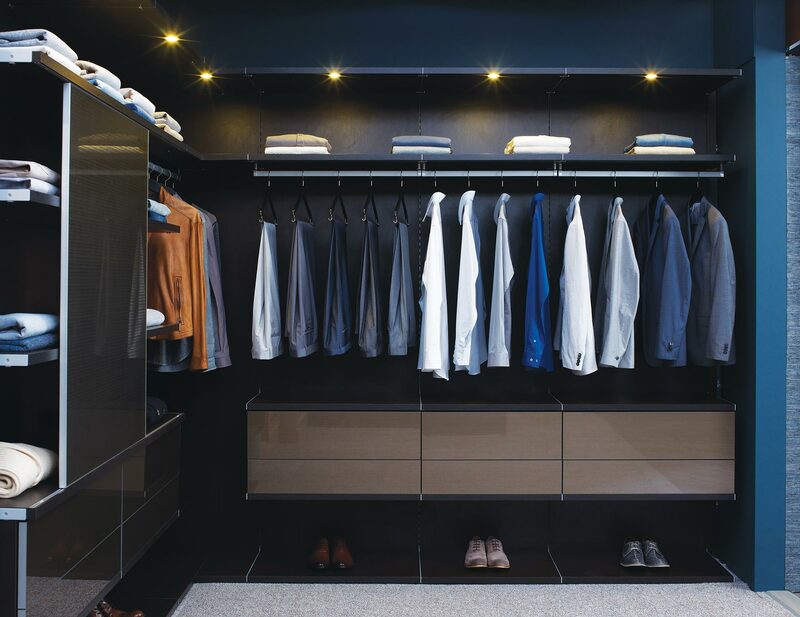 White, high-gloss surfaces and flat drawer faces create a sleek, contemporary closet that showcases every style essential. Tesoro™ Tuscan Moon and White Gloss finishes create a light color palette. Center island with White Chroma countertop creates a seating area. 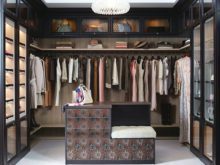 With a soft color palette and rich textural details, fashion meets function for a walk-in closet that feels like a personal boutique. Tesoro™ Linen and Corsican Weave finishes create a soft color palette. 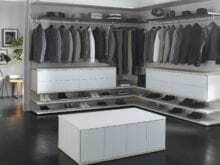 Matte Aluminum custom closet doors with clear glass inserts display shoes and accessories. Matte Aluminum hardware adds a polished finish. Glass shelves showcase collectibles and handbags. Waterfall countertop edge detail and modern top cap trim detail create a built-in look.